You’re winding down your week, and this weekend you won’t be cramming in work during every free block of time that pops up. You’re taking the weekend off. Good for you! But how do you put your work aside and forget about it…oh, and wouldn’t it be nice to avoid the Sunday evening dread about what you will be facing in the morning? As simple as it sounds, clearing off your desk before you shut down for the week can do wonders for your enjoyment of your work-free weekend. And it can generate feelings of preparedness for Monday. Take it one step further and adopt a more organized and consistent approach to your working environment, and you may find that you are happier, less stressed, and even more productive. Clutter is distracting and can derail your attention. It’s hard to decipher what is important when everything is a mess. You are making yourself work harder when you have to overcome a visual obstacle in order to get down to business. Seeing a messy desk when you are not working makes you think about everything you have to do. It takes time to find what you need when nothing is organized. Start with a clean slate â€“ If you have been neglecting your desk and office for a while, set aside a chunk of time across several weeks, if necessary, to get it to the level of clean and clear you need. Handle paper as it comes in â€“ Once your desk is clean, it’s important to create a plan for maintaining it. 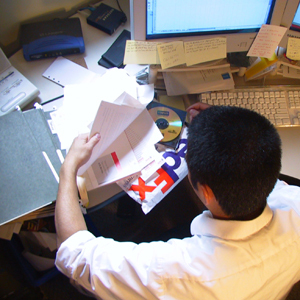 Paper, including mail, is one of the biggest culprits of a messy desk. Take time every day to file, throw away or take action on every piece of paper on your desk. Separate work and personal things â€“ Donâ€™t let your workspace become overrun by non-work clutter. Assign another place in your house for items that you don’t need to do your work (i.e. household bills, your children’s school paperwork, personal letters and cards). Don’t overdo it â€“ Avoid letting your quest for organization take over your life. If you find that you are spending too much time trying to stay neat, it’s time to step back and reevaluate your plan. Decide what clean means to you â€“ A clean and uncluttered environment means something different for everyone. Find the level of organization that works for you and stick with it. I, personally, accomplish more and feel better about what I’m doing when my desk is clean and my office organized. But, I also struggle to find the time to maintain organization as I go throughout my day. I started setting aside a few minutes at the end of the day (as I’m going through the last of my e-mails and preparing my tasks for the next day), when I straighten up and clean off my desk. And it works for my psyche. Is clutter getting in your way? What do you do about it?